the Dairon company designed new all-purpose machines whose reliability, handling are well proven: harrowing - stone, waste and grass burying - levelling - light hoeing - surface mixing - rolling. The RotaDairon®soil renovator is designed for seed bed preparation prior seeding or sodding any soil and able to do the following operations in a single pass: ground tillage, burying of stones - clods and overgrowth - grass + debris, blending of extra materials (net particles type HNETLON" or equivalent, compost. fertiliser, sand), grading, rolling and seeding (with the stainless steel seed-box SM 150, SM 180 or SM 200). The blades of outside rotor discs are oriented toward inside of the machine. The work width of the Stoneburier remains the same during the wearing of blades. The effective work depth of ROTADAIRON®attachment can easily be checked in the field. The work depth influences the quality of burying and the size of stones which can be buried. 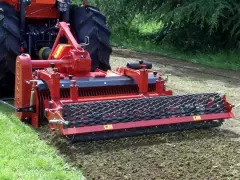 The effective work depth of a tilling machine can be determined by the distance from the outside of the rotor tube to the protection skid of the chain case. Global volume adjusted seed rate, determined by the machine's ground speed. 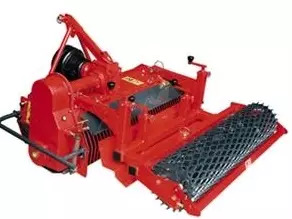 Seed rate adjustment by rotating the roller using the crankshaft supplied with the machine.